Due to titanium’s high chemical activity welding can be a real challenge but to overcome this, new technologies are being developed which uses the slag pool and argon to shield the weld site from interstitial element contamination. The basic tendency in improvement of titanium alloys is the need to increase the specific strength of structures of aerospace engineering. Owing to the strength of advanced alloys Ti-10-2-3 (USA) and VT22 (Russia), reaching 1300-1400 MPa, titanium is used more and more frequently in the load-carrying airframes and most loaded parts of engines of modern aircraft manufactured by the likes of Boeing, Airbus, Antonov, Ilyushin and others. Due to the unique chemical and electrical properties of titanium, commercial welding processes used to join thick section titanium alloys (>25 mm – 1” thick) have been limited to gas tungsten arc welding, plasma arc welding and electron beam welding. For thick plate welding, these processes are either excessively labor-intensive or impractical. Consumable guide electroslag welding (ESW) has long been recognized as the most cost effective method to weld thick-section steel and stainless steel plate; however, ESW had previously never been successfully applied to titanium alloys except in the Soviet Union. 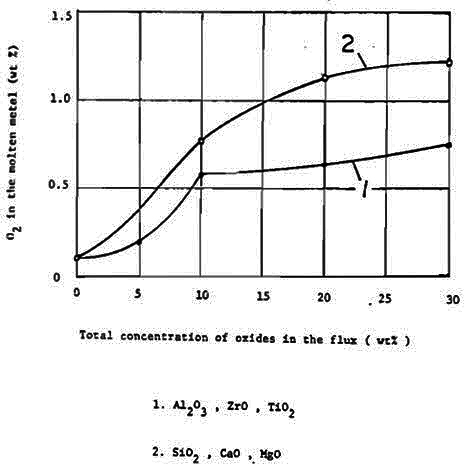 Since the late 1950’s, the only known technology for ESW of titanium alloys was that reported by Gurevich and others in the Soviet technical literature. The unique problems associated with ESW of titanium alloys are a result of titanium’s high chemical reactivity and relatively high electrical resistivity at elevated temperatures. The high resistivity causes the filler metal to melt back due to excessive ohmic heating. Titanium’s high reactivity requires fluxes to have an exceedingly low oxygen potential. Unfortunately, many halide fluxes, though free of oxygen, are deliquescent in the solid state. In the liquid state, the resulting slags are excessively conductive and provide poor heating efficiency during ESW. Due to the high chemical activity of titanium at elevated temperature (Titanium reacts violently with oxygen in the air when heated above 650°C), therefore the basic difficulty in welding of titanium and its alloys is shielding the weld metal, heated filler metal, and heated base metal from the air. This is the reason all other welding processes used to join titanium alloys are performed in either a vacuum chamber or a controlled inert gas environment. Alhough, the molten metal is protected by the slag pool during welding in the ESW process, the researchers at Paton Electric Institute found that shielding by the slag pool alone was not sufficient to protect the weld metal from interstitial element contamination. Therefore, additional argon shielding above the slag pool was needed to fully protect the titanium alloy from atmospheric contamination. They also concluded that the purest grade of argon should be used for the gas shielding. The basic argon shielding technology is to flood argon over the slag pool and since argon is heavier than air, it will sink to the bottom of the welding cavity and insulate the slag pool from the air. This technique also provides shielding for the hot filler metal before it is fed into the slag pool. The other technique, used by Shou-Kong Fan for non-consumable guide ESW of titanium alloy, was to spray argon through a pair of modified copper shoes. Figure 1: Illustration of a modified copper cooling shoe which shows the argon spraying device for nonconsumable guide ESW of titanium alloys. (After Fan)As shown in Figure 1, argon spraying from the top of cooper cooling shoes would protect the slag pool and heated portion of filler metal, while the argon spraying from the bottom of the cooper shoes would protect the solidified weld metal before it cooled to a low enough temperature. 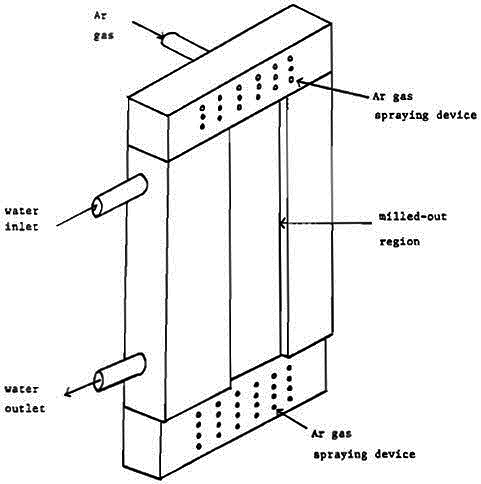 The above two methods use argon only as a neutral shielding gas between the heated weld metal and the surrounding air. Kompan et al. had used an additional argon shielding technique to not only protect the weld metal but also reduce its interstitial content. As shown in Figure 2, argon gas was bubbled through the slag pool and molten metal pool during the consumable guide ESW of a titanium alloy. They claimed that bubbling argon through the weld pool could reduce the weld metal oxygen and nitrogen contents, promote uniform penetration of the weld, and reduce the grain size in the weld metal. Besides the argon shielding protection, the flux used for ESW titanium alloys should not contain any elements (especially O, N, C, and H) harmful to the weld metal. It was shown by researchers at Paton Electric Institute that the principal requirement for the flux in ESW of titanium was the complete absence of oxides. 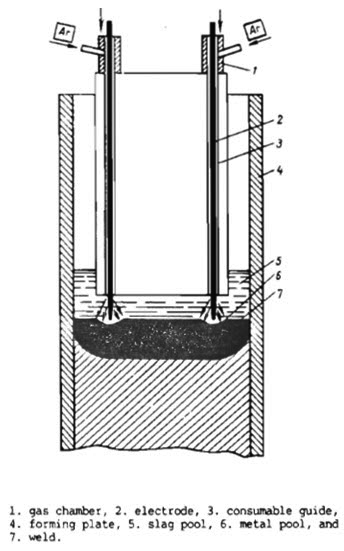 Figure 2: Illustration of argon bubbling technique used for consumable guide ESW of titaniwn alloys. (After Kompan)As shown in Figure 3, oxygen content in the molten titanium metal increased even when 5 wt% of the most stable oxides (Al2O3, TiO2, and ZrO) were added into the CaF2 flux. They concluded that only when the flux contains no oxide, will the molten titanium metal have an oxygen content less than 0.1 wt%. Therefore, the adequate fluxes for ESW of titanium alloys are limited to metal halides only, and among them the CaF2 flux is the most widely used because it has a high melting point, is cheaply available and is very stable in the molten state. 3. Sin-jang Chen: Fundamental study of joining titanium alloys using electroslag technology, 1991, Scholar Archive. 160. Accessed July 2017.